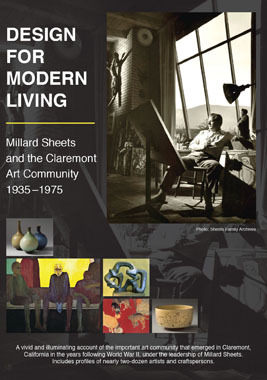 Sunday, March 22, is an important day for admirers of Millard Sheets and the work of the Claremont arts community: it’s the premiere of Paul Bockhurst’s documentary Design for Modern Living: Millard Sheets and the Claremont Art Community, 1935-1975 at the Garrison Theater. All the information is here—buy your tickets now! I’ve bought mine! Paul is the winner of five Emmy Awards, who has long been fascinated with the accomplishments of the Claremont art community. This film highlights how Sheets, Albert Stewart, Betty Davenport Ford, Karl Benjamin, Harrison McIntosh, Sam Maloof, and others made Claremont a major center for art, craft, and architecture in the postwar period. The project spawned a second documentary–Claremont Modern: The Convergence of Art + Architecture at Midcentury–in which he and I discuss my research on the Sheets Studio art and architecture for Home Savings. As I complete my book and work to create a related museum exhibition, it is heartening to see Paul’s hour-long film completed. Come celebrate it on March 22, at an event co-sponsored by the Claremont Museum of Art (the film’s co-producer), the Clark Humanities Museum, and the Ruth Chandler Williamson Gallery at Scripps College. See you there! From my interview with documentary filmmaker Paul Bockhorst, photographed by David Shearer. Posted in Home Savings and Millard Sheets, Image of the Week.